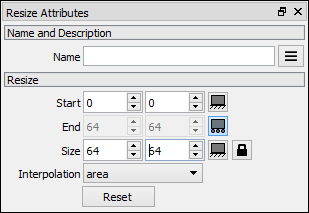 The Resize node resizes the input image to the size defined by the attributes width and height. Drag the Resize icon into the Node Graph. Connect the output of an image node into the Img input in the Resize node. The Resize node is an Input Output Pair node. The Image to be resized. The start position (left-bottom corner) of the output image in the Image Viewport. The end position (right-top corner) of the output image in the Image Viewport. The size of the output image. If checked, the output image size keeps the aspect ratio of the input image. Keeps one of the three controls as a variable of the other two fixed controllers. Interpolation mehod used when magnifying or reducing images. Sets all values to match the input image values. Shows the position and size of the input image. Shows the position and frame of the output image. Corners: Drag the corners to resize the output image. Borders: Drag the borders to resize the output image. Frame: Drag the frame to change the position of the output image.